Armored Troopers Votoms is an anime that takes place in another galaxy between warring planets involved in a 100 year long conflict. The primary combat unit of this war is giant fighting robot tank - no surprise this being anime. The story takes place after the war but still revolves around the Votom units. All of that was found online. I know nothing of the anime series. I only know I like giant robot tanks and am not partial to Valkyries or Gundam (Destroids, Glaugs and Zaku are kool though). The Votom models really appealed to me as a believable fighting suit. So when Hobby Link Japan was dumping the Brutishdog cheap I snagged one. I know it’s the pink girly one but hey, it was on sale. 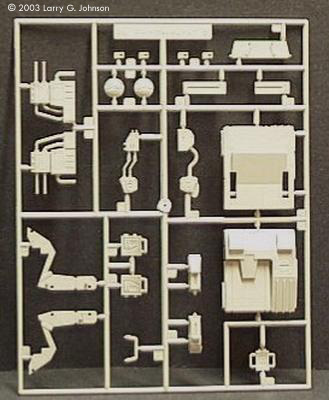 Nine trees make up the parts for this beautifully molded kit. I could find only one small piece of flash on mine and no sink holes or ejector pin marks on the outside. I deduct one point for having prominent ejector pin marks on the inside of the parts where they will need to be filled or interfere with the detailed cockpit. The detail is very crisp with a combination of raised details and engraved panel lines. Trees F, I, J and K make up replacement parts for parts already on the other trees. I assume the main trees form the bulk of all Votoms and these four trees replace the parts specific to differences in the Brutishdog model. The parts include a new helmet (including mask, collar, antennae and interior detail), new ankles and alternate hands which are interesting. 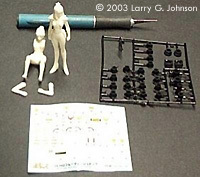 The kit comes with three hands to start with – two fists left and right, and an oddly positioned open left hand (see Tree B). These hands are almost cartoonish in appearance. The alternate trees provide left and right multi-part fists to replace the main fists. These are much better detailed, not simply being a hunk of shaped plastic but composed of detailed fingers broken down into two parts and separate palms and thumbs. An alternate open left hand is provided in more realistic multi-part detail and an alternate right hand is provided with separate index finger. This hand seems to be provided for holding a weapon and posing the index finger around the trigger. This is all interesting in that the Brutishdog only has a left hand. The right hand is replaced with a multi-barreled canon and gruesome looking meat hook. I can understand right hands coming with the primary parts that seem common to all Votom models but the alternate trees provide even more right hands then the main kit. All I can fathom is that the alternative trees serve more than the Brutish Dog as well. 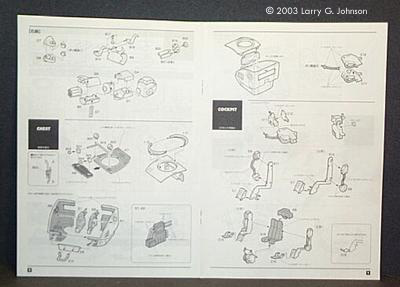 The directions are nicely laid out, clear and easily to follow with big pictures of the assembly. The only drawback, which I can’t fault Wave for, is that there is very little English here. This does not pose a problem until we come to the painting guide. There are those of us who love fighting suits and others who shake their heads in wonder. I am in the former category and I like the Votoms. 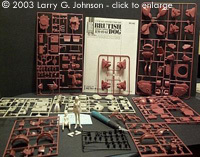 They are a diversion from the Gundams and Valkyries, and are believable designs, boxy and tank-like. 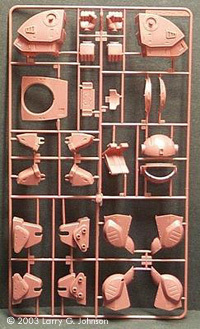 At the regular prices of $25 to $48, Votoms build into a very nice model at a nice size in 1/24th scale. 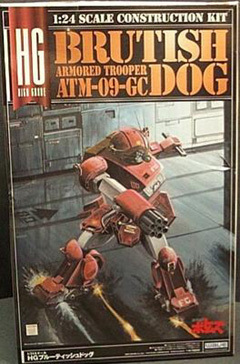 They are available through Hobby Link Japan but only the Brutish Dog and Scope Dog with Dog Carrier (the most expensive one) list as in stock. 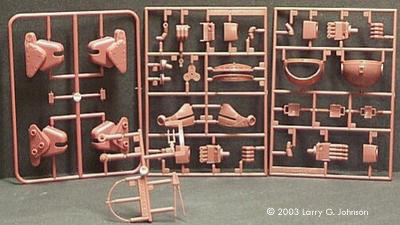 I don’t know if I can bear to paint this model pink, but I do recommend it highly for mecha fans. Many thanks to Larry's wallet for providing the review sample. Manufacturers and retailers, interested in getting your wares reviewed and publicized on a site averaging 3500+ readers a day? Contact us! This page copyright © 2003 Starship Modeler. Last updated on 22 August 2003.